1. Preheat oven to 350F and line a 9x13" pan with foil or parchment paper and spray with non-stick spray. 2. Prepare Brownies: Combine flour, baking soda and salt in a small bowl; set aside. In a large saucepan, melt the butter with the sugar and water. Bring just to a boil and remove from heat. Stir in the chocolate chips, espresso powder and vanilla. Stir until chocolate chips are completely melted. Whisk in eggs, one at a time, mixing well after each addition. Slowly blend in flour mixture, and mix until batter is smooth and shiny. 3. Prepare Cream Cheese Layer: Place all ingredients into a medium mixing bowl. Beat with an electric mixer until smooth and well blended. 4. Pour half of brownie batter into pan and spread evenly. 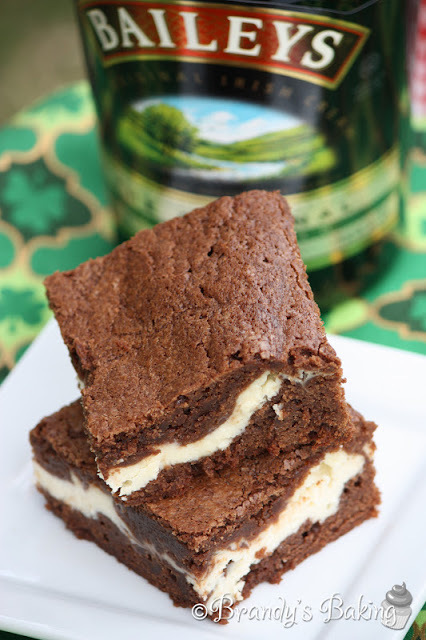 Dollop cream cheese mixture on top of brownie batter and gently spread until evenly distributed. Spread remaining brownie batter over the cream cheese mixture. 5. Bake for about 40 minutes or until center is set. Cool completely before cutting.